This was an amazing episode, but also an incredibly hard one to watch. The whole opening scene was calm, almost a relief. Madani questioning Frank and David in a safe interrogation room. Leo with her father, and all of it shot in a static, almost documentary-style tone. Then things shifted to the docks, at a odd angle with Castle and David alone literally back up against the bay with nowhere to run. It symbolized a lot of things, an ending to the journey we’ve been on. This is the end of the story for David, and possibly for Castle, too; their goals very different, but ultimately winding down. Then the exchange started, with Billy watching from afar. David’s trepidation, fearing how his wife and son would react to seeing him. Sarah and Zach’s actual reactions to seeing David alive, ranging from joy to fear, encased in a total lack of understanding. I loved how Sarah grabbed his arm, needing physical contact to confirm the reality of him being alive. Then David running into the gunfire to stomp out the flames literally chasing down his family. It was a defining moment for a character that was already very clearly defined. I wonder if Sarah absorbed what David had done, for her, without hesitation. If he had died, his death would be fundamentally different from before. He wasn’t running from his family, he was defending them with his life. Which of course is what he’s been doing from the beginning, sacrificing himself and his own happiness for them. It would’ve been good for the character arc, but I’m glad it didn't happen. In the end he finally escaped the bad guys with his family, which was so much more satisfying. That side of the story was almost lighthearted compared to what Castle had to endure. It wasn’t the torture, even though watching Castle get beaten was hard to watch; it was the day dreams Castle kept having that really made everything so difficult. He was being courted by his dead wife, reliving what he had lost, including that last conversation where she confessed that he wasn’t there anymore and he had to make a choice. That time he chose her, chose to give up his life and family in the military for his one at home. That choice was the thing he kept seeing in his nightmares that have been reoccurring throughout the series. Seeing that full conversation explained the choice he made, a choice that finally framed the nature of his survivors' guilt, that he blamed himself for choosing them over the military and it got them killed. Then, after everything else, he had to make another choice: letting go to be with her again in death, or to keep fighting. However, the real power play happened on the villains side. Rawlins had always thought he was in charge, having the power in his relationship with Billy. Except that was never really the case. He was a government hack, a corrupt middle-manager convinced he was above everyone, a mastermind of everything. But really, he was never all that impressive, just evil. In a lot of ways Rawlins felt almost secondary, even though he had been the big bad up until this point. He ended up a corpse, killed as brutally as possible (which went a little further than I personally want to watch), but it was also pretty cathartic. Of course that final betrayal was a long time coming, with Billy basically siding with Frank one last time. It added some depth to Russo’s character, making him more than just an asshat. It also clarified who the real villain was, the end game, the person who ultimately needed Punishment. Billy Russo is the reason Castle needed to live, the final name to cross off the list. I wonder what Frank will do if he survives, which I’m not certain will happen. 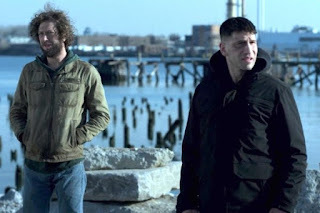 This could very well be a one season show, with Frank Castle finally laying down his life for revenge. I hope that's not the case, but I guess we’ll find out. Madani’s expression when she realized that Castle was the one that pulled the trigger on Zubair, a mix of shock and horror realizing she had the man who killed her partner but didn’t want to bring him to justice, it was perfect. This is totally random, but I just re-watched the movie Stardust which stars Charlie Cox (Daredevil), and Ben Barnes (Billy Russo) had a bit part as a younger version of his father. That’s all, just something I thought was fun. I didn’t mention it in the main body of the review, but this was a spectacularly acted episode. Everyone brought their A game, and because of that this was undoubtedly the best episode of the season. I brought up the small moments a bunch of times, the little reactions that had no words. If lesser actors had been cast, this wouldn’t have been nearly as powerful an episode. I’ve pretty much said it all already, but this was a great hour of television, and I tend to hate torture episodes. 4 out of 4 Ghosts and Monsters. The best episode of this season/series, despite Rawlins' death going past my comfort level. It just floored me that Frank allowed himself to be captured and tortured, not to mention that he could have reasonably expected to be killed, in order to save David's family and to get a tiny chance at revenge. It was a powerful episode. The first time I saw it, the violence level dominated for me. When I rewatched it, I realized that the violence was really all concentrated near the end and that it was constantly broken up by those scenes of Frank leaving his body to be with Maria. Excellent episode. Excellent review, J.D. That's exactly the level of violence I expected to see every episode before I started to watch the series. But as much as it was disturbing it was completely justified. Shooting someone with a sniper rifle (like in epsiode 7) does not feel very reveng-y. This did. I still want Madani to kill Billy, so that she can be convinced to Micro's point of view, that you have to be like them to beat them. 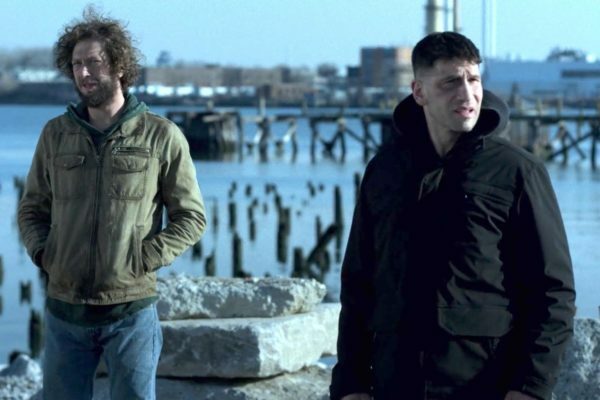 I hope Frank lives but I don't see what could a season 2 be about, so I guess it's a one and done show.